Bless your child, welcome her into this world with a deeply moving, magical ceremony which reflects the power that is a child. Spirituality is emphasized, not religious dogma. We recognize and give thanks for the exceedingly precious gift that is your child. We acknowledge and honor the unique soul that he or she is. I spend time getting to know your family. We connect heart to heart. I ask many questions to create a ceremony which perfectly reflects your needs, feelings, beliefs and values. In this way, the words and the rituals shall remain alive within you always. The ceremony is inclusive and participatory - honoring and including all significant family members (parents, grandparents and siblings) and friends (godparents, spiritual mentors) - straight from the heart. I have culled the best of all traditions creating the most extensive menu of readings, prayers, blessings and rituals that exists. For interfaith couples, language has been adapted so that it is appropriate for an interfaith, intercultural assembly of people. I also offer many universal rituals that I have developed myself (so popular with families!) Traditional aspects of baptisms and baby namings are celebrated in a universal context. You may choose traditional religious readings, or non religious readings from poetry or literature. Creative alternatives and solutions are offered and welcomed. When it comes to personalized interfaith, intercultural services, Rev. Macomb is a pioneer and an expert. 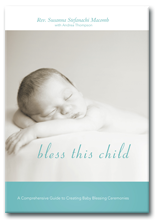 Her book, Bless This Child, A Comprehensive Guide to Creating Baby Blessings Ceremonies, is in many ways the first of its kind.